Hosting Thanksgiving can be a ton of fun, but it can also come with a lot of stress. Particularly when you get to the store and realize that chestnut and Gruyère stuffing you had your heart set on is actually going to cost more than your monthly internet bill. Thankfully (pun intended), hosting a Thanksgiving feast doesn’t have to be expensive. In 2015, the average cost for the whole shebang came out to about $69 for 10 people. If that doesn’t seem possible to you, take heart — these tips will help you keep the budget for your Thanksgiving meal in check so you can spend more time enjoying your dinner and less time manically refreshing your banking app to make sure you’ll have money for coffee when you go back to work on Monday. Figure out which dishes are most important to you, and spend your money there. Passionate about getting a pricey organic, free-range turkey? Serve cheap side dishes, like mashed potatoes, candied yams and rolls. Likewise, if turkey’s not really your thing, consider getting a smaller, cheaper bird or even just turkey breast, and then go all out with your sides. And don’t forget alcohol, which can get pricey. If you don’t know cabernet from Pouilly-Fuissé, you may as well get boxed wine and decant it before your guests arrive. But if wine is your passion, spring for the good stuff while scaling back on the rest of your meal. You know that wrinkled bundle of grocery store circulars you immediately throw in the recycling bin every week? Now’s the time to start getting familiar with them. Different stores will have different Thanksgiving items on sale, and it’s worth shopping around for the deals. If you hate sorting through all that paper, there’s an app for that. Check out Flipp, which gathers all the local store circulars for you on your phone and lets your search for specific items and build your shopping list all in one place. You can link your loyalty cards to automatically add the savings — which means you don’t have to carry around a bunch of coupons with you. Figure out which of your local stores has the best deal on turkey. 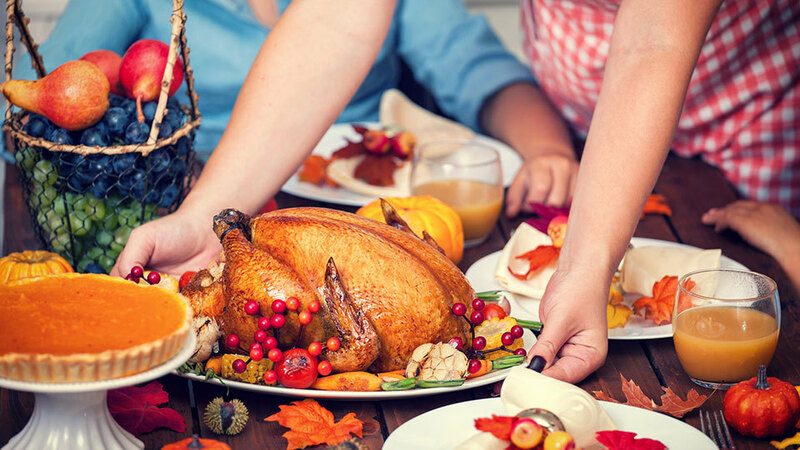 Some stores give you a free turkey when you spend a certain amount of money, while others have two-for-one deals, which can be helpful for larger gatherings. She also recommends skipping the salad dressing and making your own. “Just mix together one-half cup balsamic vinegar, one teaspoon Dijon mustard, one clove chopped garlic, salt, pepper and two-thirds cup olive oil.” Shake it all up in a jam jar to make it extra-easy. Another tip from Freeman: “In the weeks before Thanksgiving, start stocking up during the evening shops. Odds are, you’ll find markdowns on baked goods, meats and other perishables later in the day. All of these items will last weeks in the freezer.” Sneaky! If you’re on a tight budget, consider hosting a potluck. Most people want to help out by bringing something to Thanksgiving dinner anyway, so take them up on their offer this year. And don’t forget, you can ask people to help out with something other than elaborate side dishes — if they’re not much of a cook, they can help with the alcohol, pick up some pie from a bakery or grab a pack of heat-and-eat rolls from the store. Plan ahead. Choose your recipes a few weeks before Thanksgiving so you can figure out exactly which ingredients you’ll need. Going to the store with only the vague idea that you need “stuff for Thanksgiving” will definitely result in you spending money on things you don’t need while missing other ingredients entirely and having to make an additional trip to the store. You can also save money by researching your wine ahead of time. Rather than arriving at the wine shop nervous and flustered, which will leave you vulnerable to the upselling of pushy employees, take a look at these wines under $20. Go to the store with a list, and you’ll know exactly what you’re getting. Don’t let you leftovers go to waste! You’ll be paying the same amount up front for your groceries, but making sure you gobble up every last morsel of your meal will ensure it was money well spent — you won’t need to buy food for the days following your feast. Not sure how to put your leftovers to good use? Check these out, to start. You won’t want to buy everything in bulk (no one needs 10 turkeys), but if you’re purchasing items for your Thanksgiving meal that you usually have on hand anyway, you might as well buy in bulk to save some money in the long run. For instance, paper towels, chicken or turkey stock, bags of potatoes and onions or extra toilet paper for your guests can all be bought in bulk. You’ll end up using all of it, even if it’s not on the day of your meal. Also keep an eye out for deals on wine. Many stores have bulk discounts when you buy six bottles or a full case, so keep that in mind when you go shopping. No one goes to Thanksgiving dinner for the decorations. You can save a ton of money by skipping them all together, but if you want to spruce things up a little bit, look to nature. Pine boughs, dried grasses, pinecones, colorful leaves — all make for eye-catching decor that costs nothing. With the oven running all day and a house full of guests, chances are you can turn down the thermostat. It seems small, but every penny counts, and you could save on your heating bill.